WEST COLUMBIA, SC -- Lexington Two announced Cayce Elementary kindergarten teacher Mandy McLemore as the first H&R Block Top Teacher of the Block. McLemore was surprised in her classroom Dec. 3 with balloons, cake and a recognition certificate, courtesy of H&R Block’s Joe Carraway and Sophia Cornish. The district and tax preparation company are teaming up to recognize excellence in education. McLemore was nominated by Cayce Elementary Principal Andrew Drozdak, who noted: "This year we have asked our kindergarten group to really dive into our achievement team process. Mrs. McLemore has been a leader in this process. She has worked with our team to develop common formative assessments that provide them with the necessary student data to use research-based classroom strategies. This leads to student growth and, ultimately, achievement of mastery of the content." 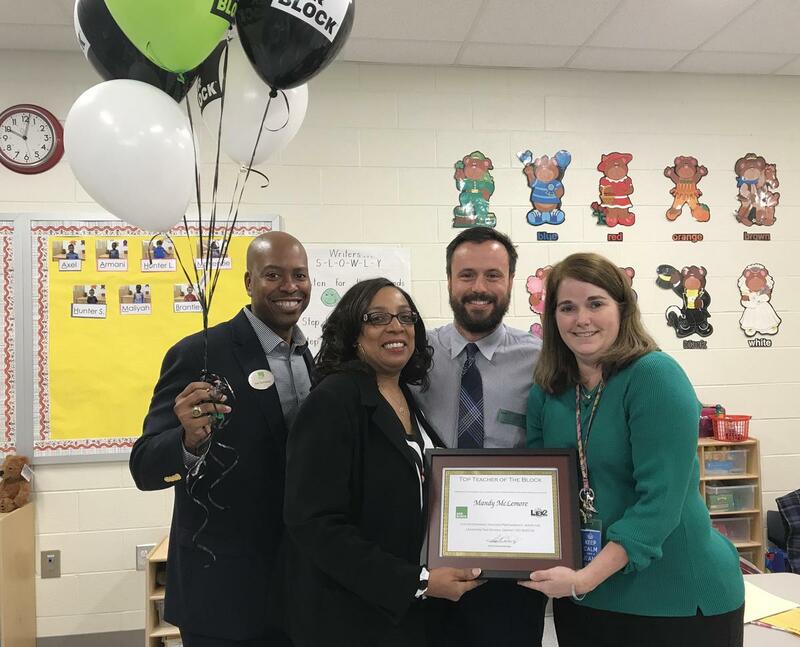 H&R Block, which has given Teacher of the Block recognition for several years, will recognize a new Lexington Two educator monthly through the end of the year.